The sensation of the 1966 Turin Motor Show, this was the second model from Alejando de Tomaso's stable. Styled by world famous designer Giorgetto Giugiaro during his tenure at Ghia it was arguably the world's first mid-engined sports car when it entered production in 1967. It was christened 'Mangusta' (Mongoose) in reference to the legendary AC Cobra with which it shared it's Shelby modified Ford 289 cu in V8 engine.Chassis construction was a Lotus-style sheet metal central backbone covered by an all-steel body including gull-wind engine covers. 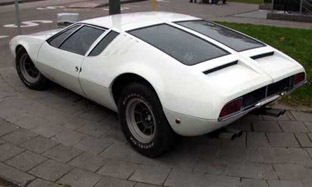 A total of 401 Mangusta's were built before the model was replaced by the more mass production oriented Pantera. Of the 401, only 120 were 'European' Spec with the 302bhp 289cu in engine, the balance were American spec 302 cu in putting out 230bhp. Later American cars also featured a less attractive single pop-up headlamp treatment.